By now, pretty much everybody knows that quinoa is the vegan’s good if not best friend. Packed with protein, this modest beet cousin is gluten-free, high in fiber, and rich in antioxidants. Quinoa also boasts a high satiety rating meaning you feel more satisfied after eating quinoa than after other grains/cereals. Lots of folks know all that. What a lot of folks apparently don’t know is how to cook it so it doesn’t taste like soapy mush. Happily, there are several ways to cook quinoa so it comes out light, fluffy, and even tasty. 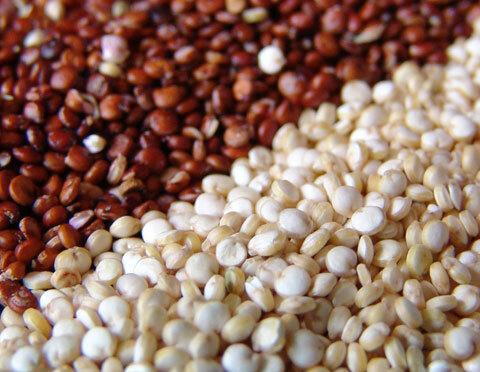 Whether you buy white, red, or black quinoa seeds, they need a quick rinse before cooking. Most quinoa has been pre-washed to remove the bitter, soapy-tasting coating, but it’s always a good idea to rinse it again before cooking. The only caveat is that you need a colander with a very fine mesh or you’ll have itty bitty quinoa seeds all over the place. If your colander isn’t fine enough, line it with cheese cloth or rinse your quinoa in a mesh jelly bag (the ones made for making your own nut milk also work well). To give quinoa a richer, nut-like flavor, toast it in a dry pan over medium heat for a few minutes (3-4), stirring often. For extra flavor, you can add seeds (fennel, sesame, cumin, or pumpkin, etc.) at this point. If you want an even richer flavor, add a teaspoon of oil (olive, walnut, sesame) and/or grated citrus zest, chopped garlic, shallots, and so on. When the quinoa turns golden (or darker) and starts to smell lovely, add water, wine, vegetable juice or broth. I often make the broth with the scraps of whatever sauce I’ll be serving on the quinoa, usually involving carrot, onion and garlic peels, and celery and carrot ends, which gives the quinoa a subtle echo of the sauce. Many recipes call for adding 3 times as much water as quinoa and draining it after cooking. That is a great way to make it taste like nothing. Instead, try cooking it more like rice or risotto; start by adding twice as much liquid as quinoa, bring to a simmer, cover the pan, reduce heat to low and cook until tender and all liquid is absorbed (15 minutes or so). That will give you a firm-textured result, good for those who prefer al dente grains and pasta. For a softer, more risotto-like result, add another 1/2-1 cup liquid (or see recipes below), return to a simmer and cook over lowest heat until it’s all absorbed. When it’s to your taste, fluff with a fork and let stand a few more minutes before serving. In a saucepan, heat oil with garlic, seeds, and salt over medium heat and toast until fragrant (about 2 minutes). Stir in quinoa and toast until fragrant (2-3 minutes). Add liquid (it will spatter at first), bring to a simmer, reduce heat to low and cook for 15 minutes. Fluff with a fork and let stand 10 minutes. For variety, add grated citrus peel with the seeds, and/or add chopped kale, chard, spinach, broccoli, cauliflower, peas, etc. 5 minutes before the quinoa is done. Spicy and sweet-hot, this succulent side is wonderful spooned over quinoa, rice, millet, or buckwheat groats. In a large pan, heat oil, garlic, chipotle flakes, cinnamon, pears, and leeks over medium high heat and cook, stirring, until barely soft (5-6 minutes). Add bok choy, chard, and cabbage, sprinkle with aminos, cover pan and cook until barely wilted (4-5 minutes). Serve hot over quinoa or any grain. Serves 4. It’s a breeze to make this lively, flavorful salad if you’ve got some cooked quinoa (or rice or buckwheat) on hand. Crunchy with crisp lettuce, carrots, and celery, bright with red onion, chives, and cilantro, this fast and refreshing salad tastes great warm or chilled. If you like, make it a day ahead and refrigerate until serving time; it just gets better! In a large bowl, combine all ingredients, toss gently and serve. Serves 4-6. Lively with chives and cilantro, mint and lime, this sparkling Spunky Thai Dressing is delicious with quinoa or buckwheat noodles (soba) or drizzled over grilled fish or chicken. It also makes a lovely lunch salad when tossed with chick peas, fresh corn, sweet peppers and red onions. Combine all ingredients in a jar and shake well, then adjust seasonings to taste. Makes about 1/3 cup. This punchy combo also wakes up mild grains like brown rice, millet, oat groats, or kasha. In a saucepan, toast quinoa over medium high heat until fragrant (2-3 minutes). Add broth and salt, bring to a boil, reduce heat to low, cover pan and cook until tender (about 15 minutes). Remove from heat, fluff with a fork, cover and let stand for 10 minutes. Meanwhile, combine remaining ingredients in a food processor or blender and puree. Toss hot quinoa with wasabe blend and serve. Serves 4-6. Robust and hearty, this sumptuously velvety, rich-tasting dish makes a splendid cool weather entree. In a deep sauce pan, heat oil, garlic, lemon rind, and nuts over medium high heat for 2 minutes. Remove nuts to a plate, add onions and mushrooms, sprinkle with salt and pepper, cover pan and cook until tender (5-7 minutes). Stir in quinoa, lemon juice, and water or broth, bring to a simmer, reduce heat to low, cover pan and cook until quinoa is tender (about 15 minute). Add wine and simmer to 10 minutes. Remove from heat, fluff with a fork and let stand for 10 minutes before serving, garnished with parsley and nuts. Serves four. This entry was posted in Nutrition, Recipes, Sustainable Gardening, Sustainable Living and tagged Basic Savory Quinoa, Lively Thai Salad, Quinoa and Mushroom ‘Risotto’, Spicy Winter Greens With Pears, Spunky Thai Dressing, Wasabe Quinoa. Bookmark the permalink.